"We Live it to Know it!" We Live it To Know It! Our roots date back to 1961 from a rural real estate firm in Aspen, Colorado. Now more than a half centrury later Mason & Morse Ranch Company has become a leader in the sale of the finest American farms, ranches, equestrian properties, fishing and hunting lands. Our services include buying farm, ranch, land representation along with traditonal brokerage and auction services for selling farm, ranch, land real estate. Combined our agents offer more than 133 years of professional experience buying and selling farms, ranches and recreational land for clients across the United States. Mason & Morse Ranch Company specializes in traditonal brokerage and auction of farms and ranches for sale. In addition to farm and ranch properties for sale, we also specialize in recreational hunting, fishing and equestrian estates. Our Brokers live it to know it and go where the land is! Founded in Aspen, Colorado, Mason & Morse Ranch Company brokerage and auction services stretch coast to coast across the U.S. From North Carolina, South Carolina to California, Oregon, Washington. In between our buyer representation and seller marketing services extend through Texas, Oklahoma, Kansas, Nebraska, South Dakota, Wyoming, Montana, Colorado and New Mexico, Additionally we have helped clients navigate transactions in Canada and across the southern border into Mexico. If there are farms for sale, ranches for sale our real estate agent land brokers will find it...And If it's time to sell, we will put our best marketing services in motion and corral you a buyer. Buying a Farm or Ranch..."You need Experienced Representation"
The visual beauty of a farm, a working ranch or luxury recreational hunting fishing property is only part of the investment. Our professional and experienced agents will guide you through the complexities of knowing the land and operations, transfering title, soils, water & mineral rights, easements and leases, habitat and on going management just to name a few things when buying a farm, ranch or recreational fishing & hunting land. We can find hard to locate properties with the right key attributes and negotiate the transaction as your buyers agent. Selling Your Farm or Ranch..."Our Marketing is Proven"
Mason & Morse Ranch Company & lLand Broker Agents bring more than 133 years combined experience in farm, ranch, recreation land and sporting property real estate sales. Our experience, professionalism and knowledge of the land, habitat, agricultural operations, coupled with high quality digital video television production, mapping, websites and online media make the unique marketing programs that attract attention when selling a farm, ranch, recreational and lifestyle properties across the United States. Our media partners include digital, print and television across the country. Mason & Morse Ranch Company featured on RFDTV Rural America Live to more than 50 million households. Or contact us by email to inquire about our marketing services, production farmland for sale, working ranches for sale, luxury ranches for sale or lifestyle and recreational hunting land for sale. "We live it to know it" ... and are here to offer you our hands on experience through the process. "We Live it to Know it. 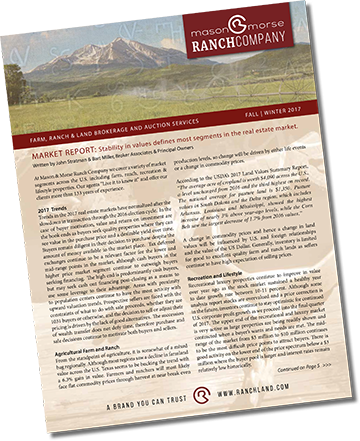 "...We know that if you do it right, farm, ranch and land real estate sales is hard work. You need to know the territory, what to look for in the land, understand the nuances of the operation and have a respected reputation in the industry. We live the agricultural & western lifestyle and understand our clients needs when it comes to buying or selling rural & lifestyle property. Farms, farmland, working ranches, luxury ranches, recreational lands and lifestyle property is our passion. We want to share our professional experience with others who desire to own farmland, western ranches and recreational land like we do. Mason & Morse Ranch Company is a real estate brokerage and auction services firm specializing in farm, ranch, luxury and recreational real estate. We provide exclusive representation to sellers when marketing farms, ranches,recreational land for sale. Our buyer representation services extend across the U.S when you need to find the perfect property. Our experience and niche marketing focus on these specific asset types is a trusted advantage to our clients. Our reach extends across the U.S. through strategic partnerships and membership in the Realtors Land Institute. Mason & Morse Ranch Company brings a proven track record to our clients when buying or selling farmland for sale, working ranches for sale, recreational and hunting sporting properties for sale. There is none which compares in importance with the great central task of leaving this land even a better land for our descendants than it is for us.